The lease is for approximately three miles of walking trails located on roughly 300 acres of forest adjacent to the subdivision marked in Yellow paint and shown in detail on the Walking Trail Map. Portions of the trails are located on subdivision property. Lease term is for 20 years, subject to early termination given one year notice by either party. Termination also possible if HOA fails to maintain trails in a safe and passable condition. 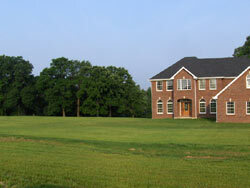 No rent due, but HOA must maintain the trails, and follow the rules, and post rules-no trespassing outside of 15 ft from the marked right of way, no hunting, no alcohol or drugs, no use while under the influence, no fires, no cutting of vegetation outside the leased property, o excessive noise, or other rules developed by HOA. HOA maintains liability insurance, and holds MKP I LLC harmless. Rules must be posted at trailhead by HOA. Use allowed by homeowners, family members, and their permittees. Only human powered travel allowed. Lease is subordinate to the use of the property for roads, utilities, construction, and any other usage that MKP I LLC deems necessary. The forest is enrolled in a Forestry Stewardship Program and certain activities to manage and harvest the forest will be carried out from time to time. A copy of the program is available on the Homeowner’s Web site. Click image to see a closer view. 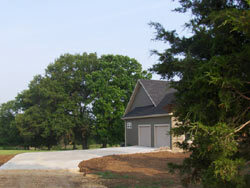 The homesites on the Home Place are large, with ground that allows a number of options. The three-year landscaping plan will allow the homeowner to create an attractive surrounding for the home. There are some thoughts that might improve the pleasure and attractiveness of the landscaping. With the large lots, the homeowner might wish to consider only landscaping the area within 100 feet of the house, and around driveways, etc. This would allow irrigation and maintenance to be optimized. The rest of the homesite is now in Kentucky Fescue, and might be left in that grass in order to maintain some native grasses. Broadleaf weeds can be spot treated. Please consult with your landscaping contractor on this matter. 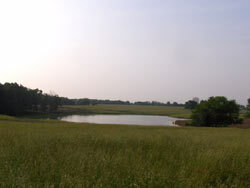 A number of the homesites will contain pond sites. If the homeowner chooses to have a pond built, there are a few items worth considering. The edge of the pond would be best protected from fertilizer and other runoff if a grass barrier is created. A width of 50 feet is suggested. The Kentucky Fescue that is now on the property is a good option, as are a number of warm season grasses. The pond should have a “runoff ratio” of six to ten/one in order to allow adequate water to be accumulated. The pond should be equipped with a dry hydrant, which is recommended by the Fire Protection District. They and the developer will share in the cost of installation, and can provide additional information on the hydrant. A couple of truckloads of ag lime spread near the pond edge and on the dam will help the new water to settle and clear up. 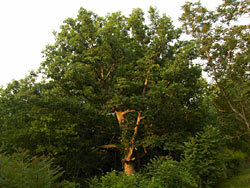 There are roughly 300 acres of forest on the home place which are owned by Master Key Place I LLC. These forest lands will be a part of the overall vision for The Home Place. The goal is to preserve, and manage the forest and its plants and wildlife while allowing access by the homeowners for walking, viewing, and other sports. The forest land is under a Missouri Forest Stewardship program that will determine activities to implement the goals for the forest land. In particular, they involve timber stand improvement and harvesting, preservation of streams, wetlands, and geologic features, creation of walking trails, and use for woodland sports activities. A goal is to create and lease walking trails to the Homeowners Association to allow use by the homeowners and their guests. In addition, the land could be made available for bow hunting under proper conditions to a hunting club made up of homeowners. The springs and streams on the property including Big Hollow Creek will be made more enjoyable, with desirable species encouraged, and exotic species controlled. SUMMARY OF FORESTRY STEWARDSHIP MANAGEMENT PLAN FOR MASTER KEY PLACE I LLC. The covenants and restrictions of Master Key Home Place Subdivision provide for a process to gain approval of residence plans, to obtain a building permit, to carry out an inspection process, and to issue a final compliance and occupation permit. This is to assist in getting a quality home built in accordance with the International Residential Code for One and Two Family Dwellings and the subdivision restrictions. To begin this process, the homesite owner must submit construction plans and samples of exterior materials of the residence to the Master Key Place Homeowners Association. The Architectural Committee will review and approve.. This will take about a week. When plans are approved, a written building permit will be issued by the building inspector, and he must be contacted to approve staking of the basement before work can begin. During construction, more inspections will be conducted using an inspection form provided to the builder. The inspector must be called at stages of construction called for in the inspection form. Notice of any areas of non-compliance will be issued to the builder, the homeowner and to The Architectural Committee. When construction is complete, the homeowner must obtain an occupation permit from the inspector before the home can be occupied. The cost of this process is $600.00, half of which is paid by Master Key Place I LLC, and half of which is paid by the first purchaser of the lot at time of closing. Master Key Place I LLC has chosen Bill Ernst, Jr. as its designee for the permitting and inspection process. To begin the process, please leave plans with an officer of the homeowners' association. We look forward to working with you on your new home! The Wastewater Treatment Plant and collection system are the property of Master Key place Homeowners Association. The treatment plant is located in the Homeowners Park and is of a re-circulating media design. It is fed by a pressure collection sewer system which is buried in the utility easement located adjacent to the road at the front 20 feet of the homesite. As a part of our responsibility as homeowners, we need to reduce potential damage to the sewer line portion of the collection system. This can be achieved by calling the Missouri Dig Rite system (811 on your phone) to request a marking of the sewer and all other utilities (electric, phone, and water) before digging in the utility easement.